Where do you go after a two year story line finally reaches its climax? And after your superstar artist leaves, to boot? 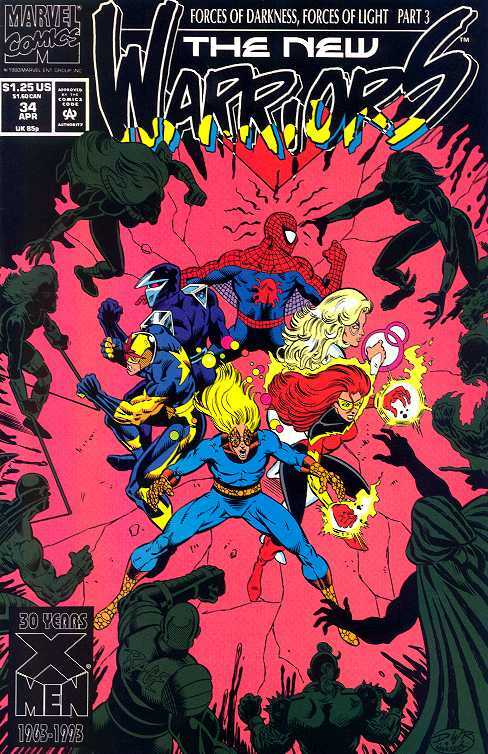 Aside from the incredible good fortune in landing Darick Robertson to replace Mark Bagley, the next era of the New Warriors was impacted in a big way by what initially seemed to be a minor story: the addition of Rage. Rage first appeared in the pages of the Avengers and seemed to be an attempt to ground and diversify the team, but he mostly came across as a bad cliché. The costume didn’t help, either (that said, Rage has never really had a decent costume). For whatever reason, Nicieza decided to add him to the New Warriors and the results were amazing. Aside from the bond that ended up forming between Night Thrasher and Rage, we got to watch an unbelievable buddy movie evolve on the page: Speedball and Rage. I have no idea why they worked, no idea how they worked, but they did. Their friendship added something that had been missing from the New Warriors this entire time. They became that grey area between the darkness and light. They were the symbolic glue that kept the team together. 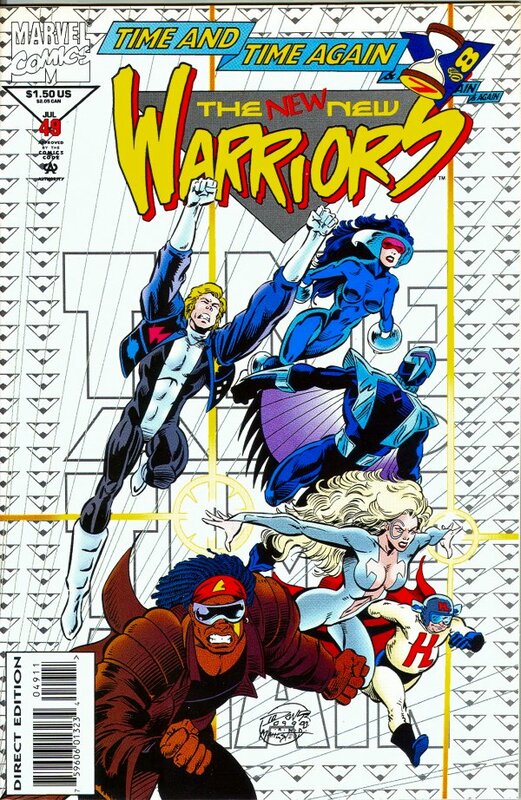 They will always be essential for a New Warriors book. These issues saw Marvel Boy locked away for the murder of his abusive father, a story that would lead to his eventual return as Justice. 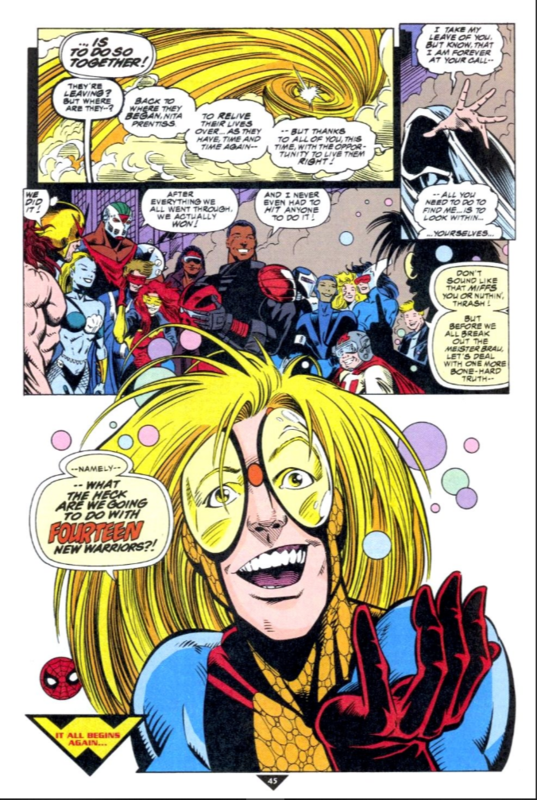 We also meet Turbo, part of the next generation of New Warriors, as well as the Cardinal, one of the better new villains introduced in the ’90s. It’s issues 29-30 that carry the most weight, though. Thrash has taken a leave of absence from the team (for his own limited series) and Nita has taken over as leader. She makes a call to involve the team in a Middle Eastern conflict, one comprised of a number of different factions. It’s yet another ethical dilemma for the team, the kind of thing that you rarely see the Avengers or the X-Men deal with. But these were twentysomethings in the 90s and ethical dilemmas were their bread and butter. To ram that point home, Nicieza frames the story with an interview the Warriors do with an MTV style channel, on a show that’s looking to “keep it real” for the kids. It’s so 90s that I can’t help but love it. The conflict in the Middle East does not go well and members of the team are forced to make decisions that they don’t feel all that good about. It’s a simplified examination of the real world Middle East, obviously, but it’s a much more complex examination than you would expect from a superhero comic (certainly more so than the Hulk/X-Factor crossover that dealt with the same country and characters). Nicieza and Robertson, just like Nicieza and Bagley, are not shying away from tackling morally difficult issues. While it’s not addressed, this is also the first time the Warriors have really been in the public eye and it went about as well as you would expect. Issue #31 is a stand alone issue which includes a huge change to a long held story from the X-books. Warpath and Cannonball from X-Force (which Nicieza was writing at the time) join Firestar on a trip to Nova Roma, the home of Magma, who was once a Hellion and a New Mutant. She moved back to Nova Roma with Empath, who was also a Hellion. The story takes a huge turn towards the end, but I won’t spoil it. It’s a solid change, though. The Robertson era of New Warriors was, unfortunately, marked by a couple of storylines that went on longer than they probably should have. The main culprit was “Forces of Darkness, Forces of Light,” which spanned 3 regular monthly issues and an oversized annual. Not much really comes from the story, aside from a boatload of characters from other Marvel books appearing in the New Warriors. It’s hard to argue against giving Robertson a chance to draw so many Marvel characters, though, and it’s also hard to argue against giving the New Warriors more exposure. It works as a kind of opening statement for the next year and a half of Warriors stories: there would be a lot of darkness, but eventually there will be some light. The darkness comes quickly in the “Poisoned Memories” arc, which sees major upheaval on the team. Nicieza had a real knack for shaking up a team without killing off any characters, which is something of a lost art. The Poison Memories are a gang who target the Warriors’ family members using information their leader stole from Namorita after a one night stand. 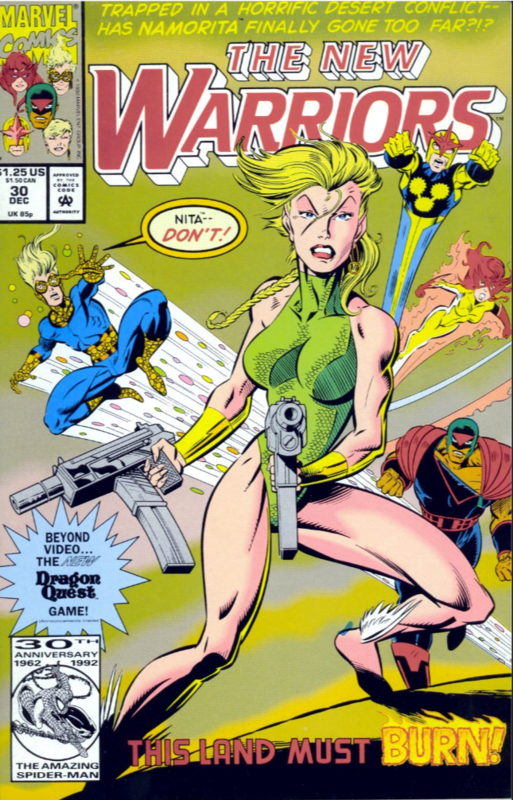 The end result is that Rage gets a new, extreme costume and commits murder, everyone’s surviving family members find out who they really are, and Namorita runs off to find herself. This is when the Warriors really become a family – shared misery will do that for you. This arc also crosses over into Night Thrasher’s new regular series and brings him back to the team. Rage’s relationship with both Thrash and Speedball grows stronger, the two representing very different sides of him. The first 10 pages of issue #37 are the most intense moments of the entire series. Okay, fine, the Nova/Supernova story only lasted 3 issues, but, man, it felt longer. All you need to know is that Rich Rider lost his powers in his solo series (he also had a spin-off title at this point) and in this arc he got them back. More importantly, it’s during these issues that we follow Namorita as she investigates her heritage. To a certain extent, she comes to peace with it, although she has no choice now that she’s, well, blue. Her will they/won’t they relationship with Nova continues to progress. As Nicieza was writing X-Force at the time, we get another crossover with them (the first being in New Warriors Annual #1). It’s interesting to compare the two teams. Nicieza didn’t create either, but it seems like it was much easier for him to break out of what DeFalco and Frenz had given him than what Liefield had. 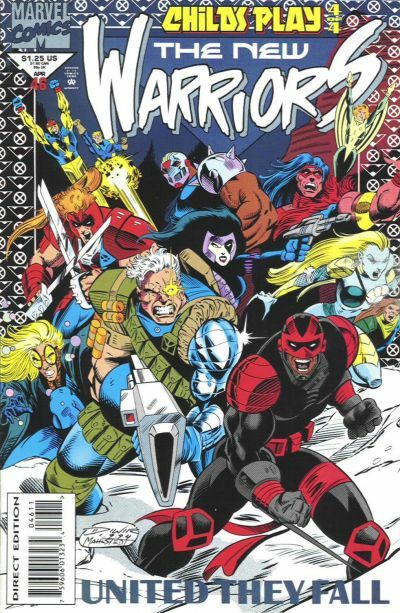 The X-Force characters seem like caricatures compared to the New Warriors. The crossover features the Upstarts trying to kill off the remaining New Mutants and Hellions. The Upstarts were always a strange group to me, if only because they just seemed kind of randomly thrown together, like one off “cool” character created by the Image founders for the X-books stuck together because there was nothing else to do with them. Just like Bagley, Robertson’s time on the New Warriors caused his star to rise, and soon he needed help on art. Fortunately, the “Time and Time Again” event is broken out into multiple threads featuring each New Warrior in a different time period, so each character gets a different art team, giving Robertson some breathing room. “Time and Time Again” is a classic story: the old team disappears, a new team is formed to find them. The next generation consists of Turbo, Powerpax (Alex Power with all of Power Pack’s abilities), Dagger (but not Cloak), Darkhawk, and Bandit (more on him later). They’re brought together by Hindsight Lad, Speedball’s neighbor who figures out Robbie’s secret identity and weasels his way into a position as the guy in the van (or Crashpad, as their HQ was called). 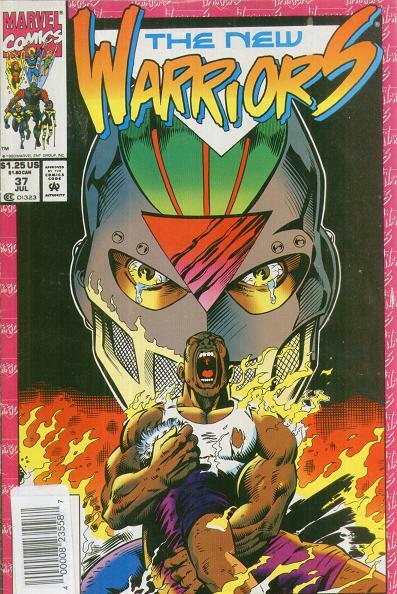 Legend has it that issue #50 was going to lead to a second Warriors books called, well, Warriors, and featuring a 2nd team. Each team was to be made up of old and new members. Two teams coming out of the 13 characters that end this story sounds fantastic. But by the time the story ended, sales had dropped too low to justify a second series, which is kind of funny considering that most comics would kill to sell what New Warriors was selling even when it was canceled. “Time and Time Again” was a fun story and splitting up the team into different time periods made for some great moments. The story easily could have gone on longer than it did, but it works well with the fat cut out. It’s an excellent climax to Nicieza’s run on the series. Issue #51 is a bookend to issue #3 and, of course, features the Mad Thinker analyzing the team. It’s a nice cherry on top of Nicieza’s run. I actually wish that a) this had been Nicieza’s last issue and b) it had been drawn by Bagley and Robertson. Instead, it’s drawn by Richard Pace, who has a brief stint on the series. Pace’s art is actually quite nice, but because he’s new, it lacks the sense of closure you’d expect from such an issue. Nicieza does take this opportunity to drop Silhouette from the team, although she’d always been something of a part time member, anyway. She runs off with Night Thrasher’s secret half-brother who you’d only know about if you read Thrash’s own book. This wouldn’t be the last we’d see of Bandit in a Warriors related comic, though. But, like I said, Nicieza isn’t done yet. His final two issues feature Psionex. They’re fine in their own right, and Pace makes the anti-heroes (as they now appear to be) his own. The focus on Mathematician is nice. It makes me wonder if Nicieza had hoped to give Psionex their own book. But it’s strange that his final two issues wouldn’t focus on the Warriors themselves. And that’s it for Fabian Nicieza. He piloted the New Warriors through 53 issues and 4 annuals. He took a group of two dimensional C-listers and made them complex, exciting characters. It’s a truly impressive run on a superhero comic. It’s a run of New Warriors that no one has been able to top.